Welcome the New Year with this fun word scramble. Frosty the snowman is beginning to melt and all of his words are getting scrambled! Unscramble the wintry words. 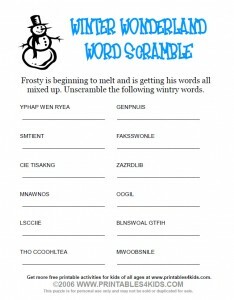 Click on the image above to view and print the activity full size or you may download the Winter Wonderland Word Scramble as a PDF file.